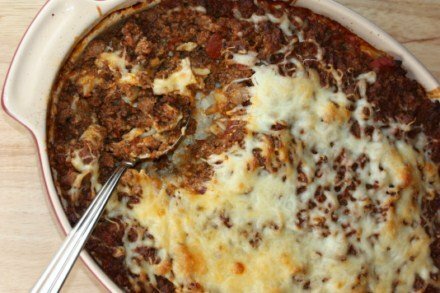 I have been making baked ziti for years, but this baked ziti recipe came about after the holidays when I was trying to use up some of the food in my refrigerator. I had picked up some cream cheese during the holidays for a really good price and I had a few packages left that were nearing the expiration date. Sometimes I freeze extra cream cheese, but I try to use it up in recipes if I can instead of freezing it. When I normally make baked ziti I add either cottage cheese or ricotta cheese, but since I had extra cream cheese I decided to give it a try instead of cottage cheese or ricotta. And it turned out so good! It was nice and creamy and had a richness that cottage cheese does not give you. So, next time you have some extra cream cheese try adding it to your favorite pasta dishes. It is so good! In a skillet, brown the ground beef until done. Drain off any fat and add sauce, eggs, cream cheese, 1 1/2 cups mozzarella cheese, and Parmesan cheese. In a large bowl or pan mix together cooked pasta and sauce mixture and spread into a 9×13 pan. Sprinkle with remaining mozzarella cheese. Bake at 350 for 40 minutes or until heated through. This looks really good, Lynn! I have hesitated using cream cheese in dishes because my husband isn’t a big fan… but I think this looks too good to pass up! OH MY! This looks really good and easy to make! Can’t wait to try this. Do you have to cover it with foil while it bakes? Yes you can do that. I do sometimes, but not always. My husband has celiac so I appreciate your methods of separating the foods. I wanted to mention that I had found a recipe for some pasta dish that used cream cheese along with Ricotta or Cottage Cheese and the extra cream cheese turned the dish completely around. It was much creamier. Made this tonight for dinner,Lynn, and it was delicious! Thanks for the recipe…..it’s a keeper!! Thanks for letting me know. I appreciate it. hi Lynn! 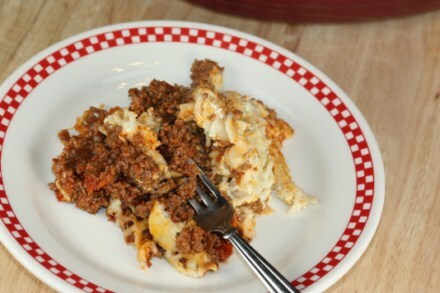 i was searching for a baked zitti recipe and i came across your blog site. i really want to try your recipe this weekend. i just want to ask, forgive me if my question may sound silly but do i need to beat the eggs before adding it to the mixture? hope to hear from you soon! The eggs just need to be mixed in well, I usually just stir them in and make sure they are combined well, but you can beat them first and it would take less mixing in. I hope you enjoy it! This has been our go to recipe for years. Today my 11 yr old made it from scratch for NYE dinner. Thank you so much!!! I am so glad that you enjoy it! And I love hearing that kids make my recipes! Happy New Year!